The River of No Return is a period romantic drama with a modern sci-fi twist – with the glamour of Regency London life combined with time travellers, anything is possible! Nicholas Falcott, Marquess of Blackdown, is about to be run down and killed in battle in Spain, 1812. Instead of death, he is met with a strange rushing sensation and wakes up in 2003 – almost two hundred years in the future. He is looked after by the mysterious organisation known as the Guild, taught how to live in modern times over one intensive year and released in the United States as Nick Davenant, with the assurance that there is no going back. He settles himself into a comfortable life in modern New York City, and for ten years he enjoys all that the modern era has to offer. That is, until he receives a summons from the Guild and is charged with a special task. As it turns out, it is possible to go back in time as well as forward – one only has to draw on powerful emotions. He learns about the Ofan – a rival organisation that the Guild is concerned may disrupt the flow of Time itself. Meanwhile, back in 1815, Nick’s young neighbour Julia Percy is dealing with the death of her grandfather. Her cousin Eamon has come to take over the manor and he is convinced that Julia’s grandfather was hiding a secret artefact that allowed him to control time. Julia is sure that it was just her grandfather’s natural ability that allowed him, and now her as well, to freeze and manipulate time. But how can she escape from Eamon without damaging her reputation, and where would she go? There are quite a few intertwined stories here that span multiple time periods, but they tie together very well. The “science” behind time travel is rather magical – no-one is quite sure how it’s done, just that some people have a natural ability to do it. At one point the Guild members say that you can’t go back to a time you have already been in – that must make it difficult for time travellers to keep track of a list of when they’ve visited where! The concept and the details of the time travel itself feels quite realistic though – the fact that the air in Devon in 1815 would have been much fresher and cleaner, but the buildings of London in 2013 were sparkling clean compared to their 19th century counterparts. The romance in this story is very swoon-worthy. It feels slightly instant at first, but the two of them have known each other since they were children, they just hadn’t seen each other for many years. Each encounter has that delightful kind of romance, you know, the type that sends shivers up your spine? Just great! The pacing is a little slow at times – a mixture of learning about Nick’s ability to time travel, and mysterious goings in with the Guild and the Ofan, but there are action scenes to keep it all flowing. The fact that the story involves people who have lived in modern times allows Bee Ridgway to include random modern pop-culture references and mannerisms, often rather out-of-place but quite funny. I’m not sure that Nick would have learned all these things so well as to slip up in his “home time”, since he was only in modern New York for ten years. 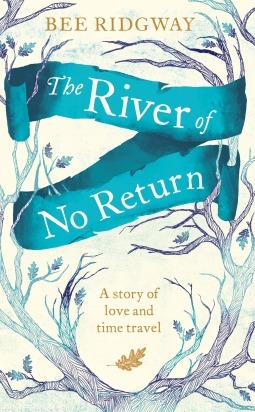 I loved reading The River of No Return and I’m glad this isn’t the end of the story – the ending has been left open for plenty more to come. A fantastic debut from Bee Ridgway that both period drama enthusiasts and sci-fi readers should enjoy! What did others think of The River of No Return? I enjoyed this as well, great review Angelya!